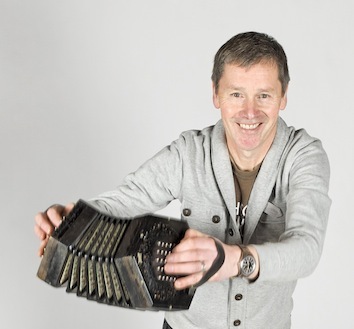 I have been playing and singing at folk clubs and festivals for over 25 years using mainly the concertina, melodeon or guitar to accompany myself. My repertoire is drawn from the great collections of traditional folk songs, sea shanties, ballads and music hall songs. Other songs have been learnt directly from singers such as Walter Pardon, Peter Bellamy and Tony Hall. I also write and perform many of my own songs, Row On, Heaven's a Bar, The Trampwoman’s Tragedy and Courting Round Dorset to name a few. Other artistes including The Yetties, Pint and Dale, Dave Webber and Anni Fentiman, Chris Roe and Phil Callery of the Voice Squad also sing my songs. Many of my songs and stories are inspired by my native county Dorset, giving them a West Country flavour. "For sheer energy and enthusiasm I can’t think of any better folk performer than Tim Laycock. His singing style suits the material he chooses, whether it be traditional a capella, accompanied by his superb concertina playing or some of his wonderful self-penned material. His thoughtful choice of programme is always presented in his inimitable exuberant style and guarantees to wow audiences wherever he appears." Mike Freemantle, Bodmin Folk Club, Cornwall. "Tim Laycock simply enjoys performing and his entertaining style of music and song is enthralling. Musical excellence, and you will not want the evening to end." Bob Kirkpatrick, Sunray Folk Club, Broadmayne, Dorset.